Swimming pools add value to a property and are a great space to spend some relaxed moments with your family. You can choose from pools of different shapes and sizes and California Creations specializes in designing and building customized pools for customers across San Fernando, Santa Clarita, Simi Valley and the surrounding areas. Pool designing is a very unique art and the when you come to us with your requirement, we can suggest which kind of pool will best suited to the styling of your home. You can choose between an in-ground or above-ground pool and this choice will be based on the styling you are looking for, the maintenance factor and your budget. 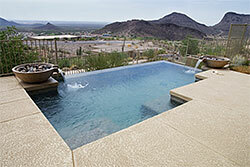 We can customize the swimming pools solution for you and will use the best materials in the construction. You can have a standard kidney-shaped pool or even rectangular, oval or square ones. We can design the pool on a Riviera concept or even an oasis one. If you like a beach-styled pool or a spa pool added to the space, we can do that too. 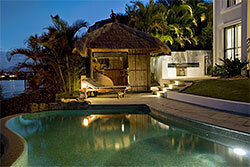 We ensure that the pool is engineered to perfection and that the surrounding space is also designed appropriately. In addition, we focus on using materials which will be able to withstand all the water and travertine flooring or pavers of any other material can be used to cover the surrounding area. When it comes to styling and concepts, there is no dearth of ideas and concepts and you can have exactly the kind of swimming pools you want. The in-ground pools are more permanent fixtures in your yard and they also tend to be a little more expensive than above ground ones. But we are also expert landscapers who know exactly how to treat the surrounding areas so as to create spaces you will love to relax in. For in-ground swimming pools you can choose from fiberglass, guinite or vinyl and we can also construct either glass or stone fences around them. If you want a kiddie’s pool area, we can incorporate that in the design as well and will create the necessary protective boundaries and steps in that space. The above ground pools are a little simpler and we will ensure that the land is properly leveled before installing the pool on your property. 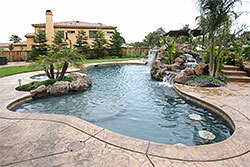 For those who are looking for something different from the ordinary, Jacuzzi pools and endless pools are a great option. These complement the spa pools and we can create an excellent relaxation zone for you on your property with beautifully-designed and well-structured pools. If you have a pool idea, we will make it a reality. If you need ideas, we can provide you those too. We focus on providing you with quality and all the work is handled very efficiently and professionally within the allocated budget and time frame. 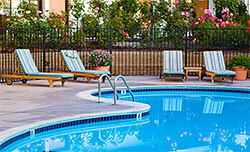 Call California Creations for the best swimming pools design and installation on 818-083-1213.